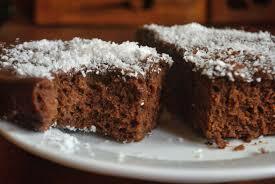 The Chocolate/Coconut cake is one of my favourite. If you stopping by La Maison du Cacao in Basse-Terre Island don’t forget to go to the souvenir shop and buy cocoa-based products. In this recipe, I am going with cocoa paste (cocoa liquor) as it is true dark chocolate. I think that a chocolate cake with dark chocolate definitely taste better. Cocoa paste is the natural product of ground nibs. Raw cacao paste is made by crushing raw cacao beans into a liquid. Once solidified at room temperature, it becomes 100% pure bitter chocolate. Because no heat is used in this process, cacao paste retains its natural properties. Finally, Cocoa paste is rich in antioxidants and makes a healthy addition to raw desserts and smoothies. You can enjoy this Chocolate/Coconut cake with ice cream, whipped cream, a cup of tea or even a hot chocolate if you are a chocolate lover. Also if you don’t like coconut you can skip the last part, the cake will still taste good.